Look at what I woke up to this morning. I know!! How cool. Thank you to Lou @ The Quiet Life who passed this on to me. Awards, though welcome here, have taken on a bit of a "you touched it last" edge to them. I do like them. Is it bragging? Sure is. I am bragging about the fact that someone in this huge world has read enough of what I write to think of me when they are given one of these awards. People I have never met come back often to catch up on nothing in particular. They comment and poke fun. They empathize or sympathize. Sometimes they do as Lou and several others have done and they offer me an award badge for my blog. Thank you. I will display it proudly and I will also pass it on. You can duck or you can catch it square in the face. What matters is that you know someone else has thought of you this day even if you don't want to display it or to pass it along. This award comes with the task of making a list of 7 things that I love, not including people. Just seven? I think I can do that. Then I must pass this on to 4 of you. I hope you enjoy it. Cooking and entertaining. I love guests. Everyone is always welcome. Bring wine. Sitting in the dark watching the world go by. I started this by getting up an hour before my kids when they were little so I could have quiet time and organize my head for the day. I still do it but now it is from not being able to sleep. Blogging. I have learned so much this past 7 months. I have made some really special friends and contacts. I have seen a whole new world and I love it. Reading. I read a lot but I don't retain a lot. It is just for enjoyment with no expectations. I read anything and everything from newspapers to novels. Text books to tomes. Genealogy. I can't get enough of this. My own family tree is huge and goes back to the late 1500's in France. I do them for others too. Any one I can find that wants a tree done. I am very tenacious and I dig and dig until I find what I am looking for or can conclusively say the information isn't available...yet. It is like doing the New York Times crossword puzzle. Laughing. I laugh out loud every day. At you, at me, with my coffee group, with my husband or sons. Out loud. Amazingly relaxing. Creating/Crafting. I like to create things. I paint and cross stitch. I decorate with many made items. I am always looking at stuff in stores and saying "I could do that". Just don't look at my project room. Robin @Miscellaneous Thoughts Robin has such an interesting blog with many different things to enjoy. A common thread seems to be some beautiful flowers. Marla @ Seven Palms is a creative blogger who is also a great participator. Cindy @ Collector at Heart Cindy has great variety on her blog. She is learning lots of new things and joins in readily to the memes and themes that are out there. 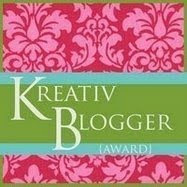 Ladies I hope you enjoy your awards and post the Kreative Blogger badge proudly on your sidebars. Don't forget to pass it on. Do you really think my blog is Kreative??? Holy Cow. I think it's just a blog. Thank you and I will hopefully be able to come up with 7 things that I love... I have 7 things I hate lol but many I love. I'm finding that folks aren't keen on awards lately, so I'm not sure if I will pass it on, but I thank you Lori. Congratulations on the award! I really enjoyed reading your 7 things. I haven't been finding time to visit and comment as much as I would like lately, but wanted you to know how much I appreciate hearing from you. You've asked about the lack of front yard flowers at the homes I've photographed lately in West Tennessee ... I think there are multiple reasons. 1. As you suspected, it tends to be VERY hot and dry here in late summer. Flowers can be kept alive, but it requires a LOT of watering. Having said that, we've had more rain than usual lately. 2. A lot of people around here plant annuals in front yard beds, but they're usually finished blooming by this time. 3. I believe that most blooming perennials don't mind hot days, but prefer cooler temps at night than we have here. 4. Most importantly, I suspect that it's a cultural difference. We don't have that English tradition of cottage gardens. Once in a while, someone will decide to have a front lawn filled with wildflowers, and the neighbors will complain because seeds from them are affecting the perfection of their carefully-manicured grass. If locals have colorful flowers, it's usually in the back yard, particularly in pots on decks and patios. Otherwise, some hanging baskets on the porch and a couple of potted geraniums out front is about it. Right on the cooking part for me too!! I think you really deserve this award! I love reading your blog and you make me laugh out loud lots of times. It is really good for your health and your spirit.